The principle cleansing system of the body is the liver, it is always working at burning fat and cleaning and purifying the blood. The liver produces bile for healthy digestion of food, and then disposes of toxins, a by-product of the food we consume. It also cleans the blood of medicines, alcoholic beverages, and external toxins we may breath in or that could be absorbed by the skin. Keeping the liver functioning well is vital if we want good health. There are several foods that promote the liver to detox our bodies regularly, and radishes are one of those foods. 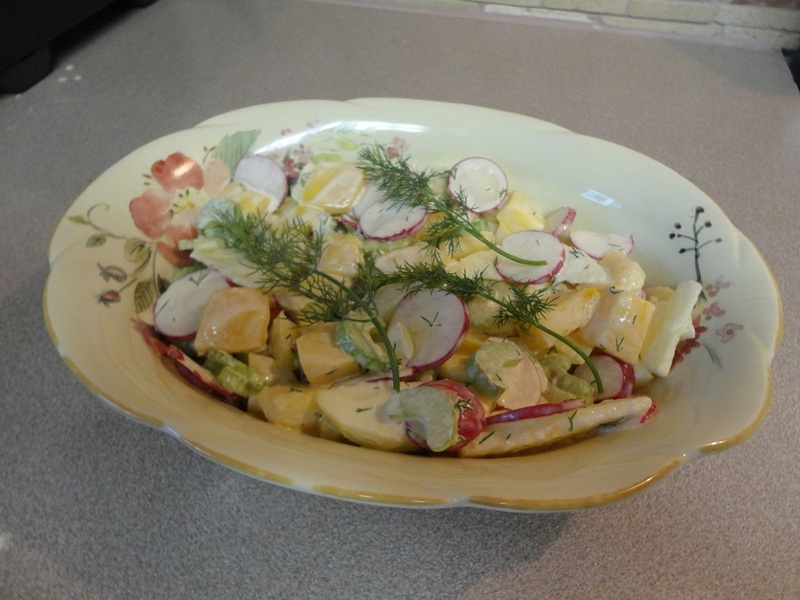 Our featured recipe is Apple Mango and Radish Salad, and besides tasting great it is healthy for you and your liver as well. The recipe contains fresh dill, and scientific studies have shown the oil of dill is toxic to five bacteria’s that are harmful to us, including Staphylococcus aureus. A study at the University of Vienna reported that dill extracts taken from seeds, and that were stored for 35 years, were still able to kill several fungal strains such as the mold Aspergillus niger and the yeasts Saccharomyces cerevisiae and Candida albicans. What makes this salad so wonderful tasting is the flavor of the dressing. Once you have poured the dressing, mix in with the fruits and vegetables until well coated. The salad pairs well with any barbecued food, or to take to a potluck. 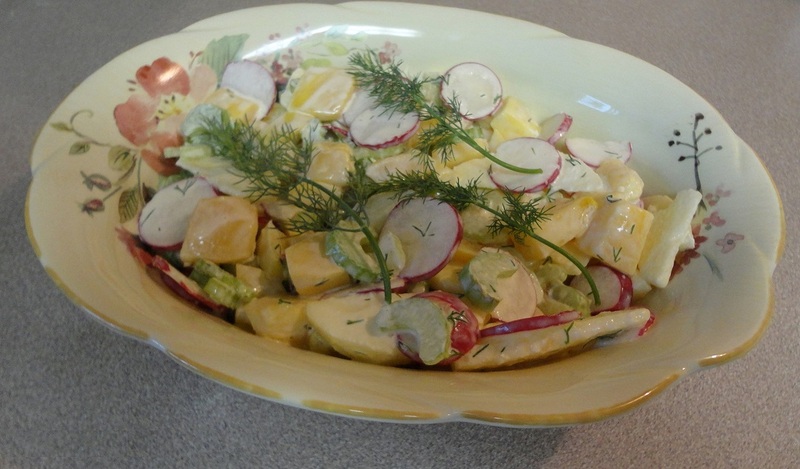 Enjoy the color, the flavor, and health benefits of Apple Mango and Radish Salad. This entry was posted in Soups and Salads and tagged Apple Mango, bacteria, Candida albicans, Celery, Coconut oil, detox, digestion of food, Dill, dill oil, fuji apples, herbs, Horseradish, liver detox, Mango, Radish Salad. Bookmark the permalink. I am glad it is eye apealing!! It is a colorful salad. Hope you can give it a try!! Thanks Roger for stopping by and for your comment. Two of my favorite ingredients – radishes and horseradish. You don’t see a lot of recipes with them. and this looks fabulous. Thank you!